Featuring Dark Passions Cracked Egg-cellance Nail Appliers at Bunny Hop Hunt & VENGE Plume Lashes/Lipstick/Facepaint at SaNaRae. Closeup pictures below and more information about these items and other stuff I used below them. Happy Sunday! ⚪ Dark Passions Cracked Egg-cellance Nail Appliers at Bunny Hop Hunt until April 14. Dark Passions has six nail appliers for the Bunny Hop Hunt. Just find the Easter Eggs and buy them for 25L$. Each comes with appliers for Maitreya/Omega/Slink and a HUD Applier of 6 options. ⚪ VENGE Plume Lashes, Lipstick and Facepaint at SaNaRae until April 17. Plume Facepaint Catwa & LeLutka HUD Appliers of 5 options for 249L$. Plume LeLutka Lashes with HUD Appliers of 10 options for 249L$. Plume Lipstick Catwa & LeLutka HUD Appliers of 5 options for 99L$. Free demo of everything to try. Head: LeLutka by Jaden Art & Thora Charron – Piper 3.3. Body: Belleza by Tricky Boucher – Freya v5.1. Skin: Glam Affair by Aida Ewing – Amara. Eyes: Euphoric by Demi Placebo – Min Soo. Tattoo: Nanika by Sdevas – Hydrangea White Rare. Nose Ring: Avada by Stephanie Fishnet – Celeste. Hair: DOUX by David Cooper – Jimena. Dress: Lybra by Natzuka Miliandrovic – Lara Gift. Parrot: Flair ‘n’ Style by Sam Viper – Animesh Parrot. Pose: WESTSIDE by Jennifer Moretti West – Closeups 1m. Feathers & Fireflies: Persefona by Persefona – Floating Feathers Classic & Micro Fireflies. 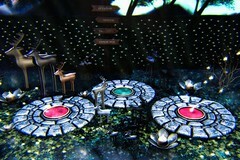 Backdrop: FOXCITY by Satomi Masukami – Glitter Box w Colour Lights. Have you ever had one of those days? Well, I am sleeping with my eyes open, escaping reality while lucid dreaming in my own fantasy world. This post features Vanity Hair Diablessa Hair (without the horns) & VENGE Valentina LeLutka Eyelashes. Please look below for all information about these items, closeup pictures, and the featuring designer’s contact information. If you are interested, don’t forget to scroll all the way down too as I always have more credits about other items I am wearing or using and other social media platforms you can find me on. ⚪ Vanity Hair Diablessa Hair. Diablessa Hair comes with a Rigged and Resize version. It comes with black and red Horns. In a previous post I already showed this hair with the horns, this time around I am showing you how cute this hair can be when you wear it without them. Color Packs: All Blacks/Blonds/Browns/Red & Happy (299L$), Music Lovers/Must Haves/Ombre Naturals (499L$) and Greedy Pack of 208 colors (1499L$). Free demo to try. Each Color Pack comes with a Vanity HUD to choose your hair and streaks colors. With the HUD you can also resize your hair if you wear the resize version and tint your hair and hairstreaks with a color picker. Also included is Catwa/Omega Basic Hairbase Appliers, Basic Tattoo Layers and a notecard with the HUD Instructions. Diablessa is available at Vanity Hair Inworld Mainstore. ⚪ VENGE Valentina LeLutka Lashes at The Makeover Room until January 26. Valentina LeLutka Lashes are beautiful lashes with lovely heart details in them, great to have for this coming Valentine season. It comes with a HUD that has 5 color options plus one Tintable option that you can color any way you want. I am using the tintable option. Important is when you are using the 5 color options to use the tint option on your LeLutka Head Hud and tint them white in order to see the color clearly. If you need instructions here is a handy video that Vixn Dagger made: turn off black lashes! You can get these at the event for just 149L$, there is a free demo at the stand to try! Skin: ItGirls by Annie Jolifaunt – Sui. Eyes: [ MUDSKIN ] by Sopha Portal – Soul Eyes Collection for Powder Pack. Makeup: Studio Exposure by Ashamti – Paradise vers.o5 for Powder Pack. Dress: G-SHOT by Gshotowner – Avax. Pose/Projector/Photobooth: FOXCITY by Satomi Masukami – Highlights1/Large Stripes/ BAD.